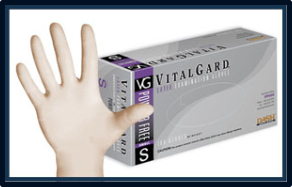 Dash Vitalgard PF Latex Exam Gloves..This excellent line of gloves is ideal for dental and medical applications. These gloves are 6.3 mils thick and have a textured surface for a excellent grip in wet or dry procedures.. They are powder free so there are no health issues.